A house with sufficient space for a circular driveway in front can look very elegant in terms of curb appeal. The yard space that will comprise the island area should blend well with all yard landscaping. Your goal should be to design the island to harmonize with the entire front of the house. Creating the circular shape will require some simple geometry to space the island curbing correctly. Aim for a properly sized driveway island that will not look too large or small. Measure the yard area for the driveway. Use a carpenter's sliding measuring tape to define the dimensions of the circular driveway that will form space for the driveway island. Mark off the circle by placing a stake at its center. Stretch a string out 10 feet, or whatever length is appropriate, to mark the border edge of the island circle. Define the whole island circle by moving the taut string around 360 degrees. Drive a stake every 18 inches or so to show where the curb will go. Sketch the house, driveway, island and yard. Design basic landscaping for the whole area. Transfer everything to graph paper to see if the island and driveway look right from a bird's-eye view. Plan to install mostly grass on the island with borders of short bushes and mulch, for example. Create a tentative landscaping plan that you fine-tune after constructing the island curbing. Plan the driveway paving materials and the material for the island curb. Design the style and height of the curb for the island first. Add paving to the driveway after the curb structure is in place to secure the island's borders. Use pre-cast concrete stones for the curb, for example. Build the curb out of poured concrete as another option. Plan the curb at least 7 inches higher than the driveway surface. Choose further details for the island once you can envision its dimensions. Plan to install a small statue among climbing vines and dense ground cover, for instance. Possible choices also include small dwarf trees or evergreen bushes. Figure out how much attention you want to draw to this circular space, especially if other yard areas will have significant landscaping. Plan stages of construction. Run conduit for any landscape lighting around the circular island before adding masonry, asphalt or paving bricks. Install the island curb and add landscaping soil before paving the driveway, if possible. Pave the driveway with stones, concrete or asphalt last in order to seal the seam neatly around the island curb. 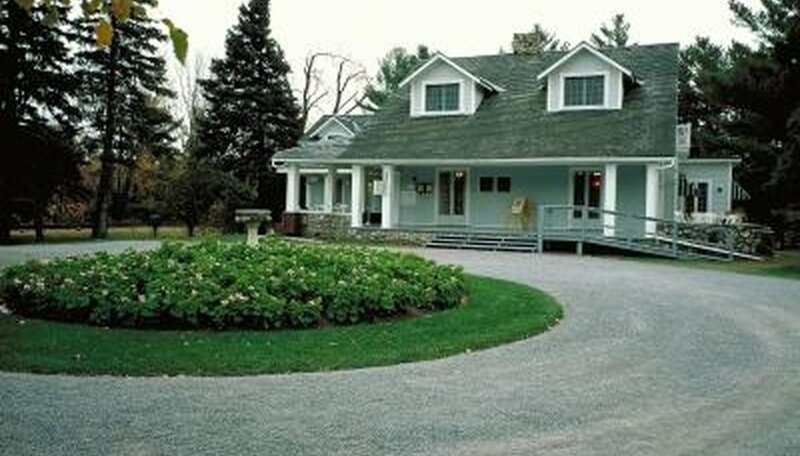 Landscape Design Expert: A Circular Driveway Is Elegant and Functional!